Ostara is the start of spring when day and night are in perfect balance. It is the time when the Triple Goddess starts out as a Maiden and conceives her child. The eggs represent this quickening of the womb. 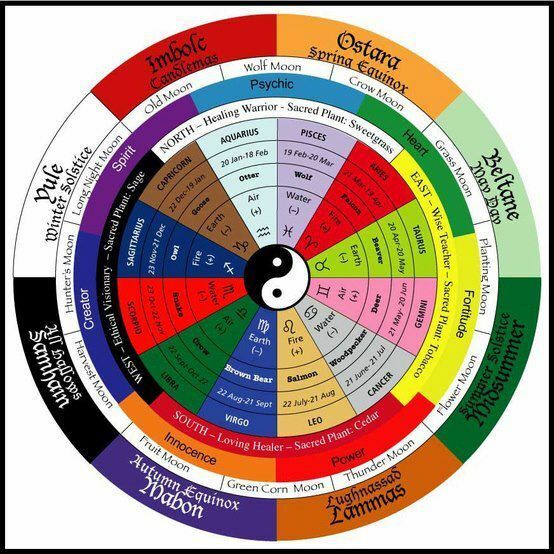 The Ying/Yang symbol represents the male and female energy all living things have inside of them.It is a time to plant your seeds to nurture them into seedlings to plant on or around Beltane when the Triple Goddess enters the Mother aspect. 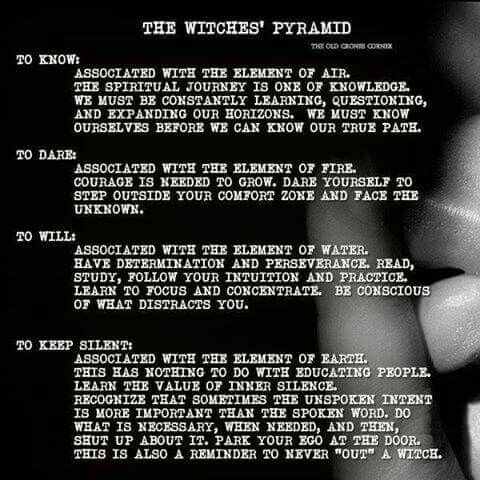 Below are the things that should be prepared ahead of time for our ritual. I suggest not making the eggs more than 2 days in advance because we will be eating them during the ritual. 1-8×11 Inch Piece of Plain White Paper – With Ying/Yang Symbol Drawn on it. I suggest using a dessert plate to draw the circle on the paper and then cutting around the outside of the mark. Holes cut out to fit 1 egg in large part of each side of the symbol. I suggest using a shot glass or something the same size to draw th circles, then cut inside the lines. Keep circles you cut out. One should be colored the lighter color and the other the darker one (you will be taping them back into the Ying/Yang symbol. When coloring the eggs and Ying/Yang symbol use the lighter shade on one side and 1 egg. Then use darker side to do other side of symbol and egg. Black Sharpie or similar Marker to write on the eggs with. Before the ritual the eggs should be colored, the Ying/Yang symbol drawn and colored. Cut the circles out of each side of the symbol to nestle the eggs in. The reason for putting the opposite color egg into the symbols is to show how if it is the masculine side they have some feminine qualities and vise versa. Below will be a drawing of what each step in making the symbol and eggs will look like. My drawing with the Paint program on my computer is not that good but at least it will give you an idea of what I am talking about above. First should have all ritual items as close to your computer as possible, so you can follow along with ritual easily. Something to save egg shells in -you will be “planting” these either in your garden outside or in a pot inside with some type of seeds (flower or leafy plant or a vegetable- whatever kind of seed is your choice) You can refrigerate or freeze egg shells until you are ready to plant them on Beltane.The egg shells will help nourish what ever seeds or plant you chose to use them with. The actual ritual will be posted one week before our gathering in the post that has the date, time and place. Just scroll down this page to find it. I found this wheel of the year and thought “How great to have so much information in one picture.” I suggest bookmarking it for future reference. ….part of the Universe and all that is in it and they are a part of me. These things make me stronger and able to live this lifetime to its fullest. As the plants wither and die the give back nourishment to Mother Earth. As the leaves fall from the trees to help insulate the plants that will bud again in spring. I wish Mother Earth a pleasant slumber under a Prue white blanket of snow. To reguvenate and wake refreshed when spring time comes again. I thank Ra and Father Sky for the warmth and rain that helps the plants and trees to grow. May they find time to rest as the days grow shorter and the night longer. 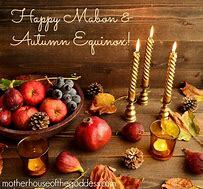 I thank the elements Air, Fire, Water and Earth for their willingness to help the plants and trees reach maturity and to spread there seeds far and wide. I ask the Universe to watch over us all; plants, trees, animals and humans throughout the cold days and nights to come. 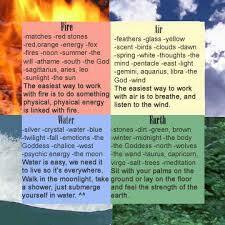 We can work with the elements at any time as long as we do not try to harness them. which we commune with and use on a daily bases. feeling a draft for no reason, hearing water running when none is, etc. Spirit is used any time you call upon a God and/or Goddess and/or an Archangel for help with something. thank whom ever you called upon to lend power and help to whatever you are doing. 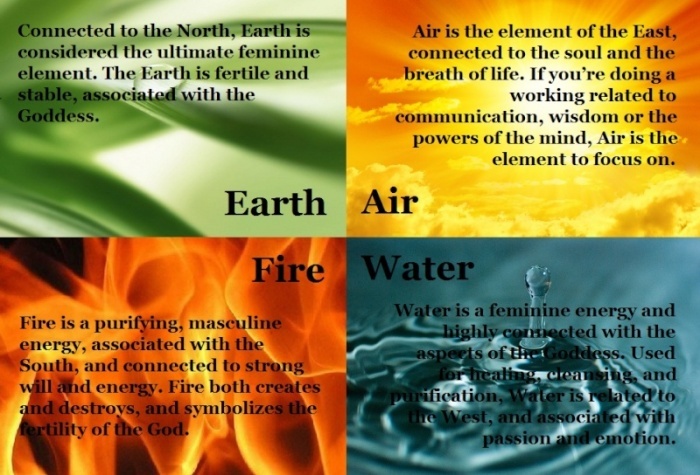 The element of Air is most commonly called upon when needing help with somethig that is intelligents, i.e. home work, getting a job done by a deadline, some times just thinking straight, etc. love is not the same as asking for a specific person to fall in love with you. home all the time or vise-virsa etc. 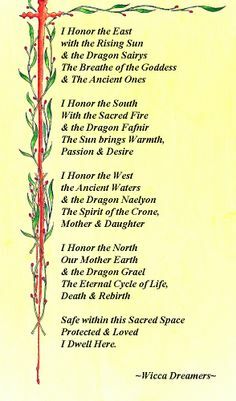 Spirit is always a guiding force during Rituals and should also be represented on your Altar. of all things also known as the female and male aspects. The tools you use for magickal use are blessed and put aside just for using when you are doing something in The Craft and/or The Old Ways. They are not to be used as daily objects such as a glass for water, or a salt shaker, or knife you would set on the dinner table during a meal or a candle holder for display, etc. The items are listed in what I feel is order of importance. If you use wood you will want to find a tree that “calls” to you and ask it for a branch. Make sure you cut the branch cleanly when taking it. It should be about the length from the crook of your elbow to the tip of your middle finger on your power hand (the hand you write with). Again some people like a shorter wand while others may want a longer one. Make sure you have brought something to give the tree to thank it for the gift of your wand. Measure of You Cord – The length and how it is made varies widely according to who you read or talk to. Cleanse the cord before you start making your measure of you cord. This cord is made during your dedication to The Craft and/or a Goddess and/or God ceremony. I teach the cord should start about 7-9 feet long depending on how tall you are. It should be made of a natural material, so not nylon, such as silk or cotton (if you are on a budget like me you can use a piece of a regular clothesline). You hold it up so one end is touching the floor and put a knot there for your feet and the cord to help ground you. You tie one knot for 6 of the 7 main Charkas. Going from bottom to top one knot at each point – even with your groin, even with your belly button, even with your diaphragm, even with your heart, even with your throat. The last knot is tied even with the top of your head or crown Charka to connect you with the Universe. On mine I took small pieces of ribbon the color that corresponds to the Chakra it was tied for. So again starting bottom to top at groin would be a red ribbon, Orange next, then yellow, then green, blue, indigo, and purple at the crown Chakra. Some people also measure their arm and leg lengths. However, you choose to make yours cut off about an inch away from the top knot whatever cord is left over and discard. This cord is then tied around your waist during any gatherings, rituals or ceremonies you may attend. When not being worn should be kept in a small bag made to hold it. This is the most personal of all your magickal tools no one else should ever handle it. Atheme-ceremonial knife – some people have this sharpened others do not. I have a sharpened Atheme that I also use as my ceremonial knife. To me and other people they are one in the same. To others, they are two separate tools. This is again a personal preference. Heat proof container for burning special charcoal briquettes – These are not the same as you would use in a grill, these can be deadly if used indoors. The ones here are made to burn inside to put loose herbs, incenses, or essential oil on. Sword – Length is a personal choice. A Cape worn only for rituals and ceremonies.